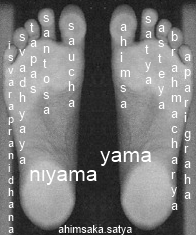 1 yama (ethical disciplines) ; ahimsa (non-violence), satya (truth) , asteya (non-stealing), brahmacharya (dwelling in oneness) and aparigraha (non-collectiveness); the rules of morality, targeting the roots of all sorrow; greed, desire and attachment. 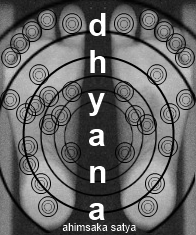 2 niyama (individual disciplines); saucha (purity), santosa (contentment), tapas (austerity, purifying heat, body, speech and mind, without any selfish motive), svadhyaya (study of the Self) and Isvara pranidhana (devotion(bhakti) for oneness, whole-ness). 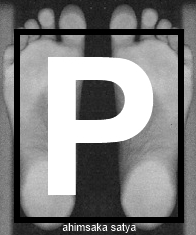 3 asana; postures, meaning literally “to take a seat” preparing the body for prolonged periods of sitting (meditation). 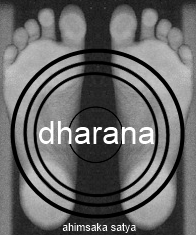 Asana brings steadiness,balance, health and lightness to the total body on level of the physical body (muscles, connective tissue, nerves, glands, organs, endocrine system, immune system and nervous system), pranic (air) body, mental body and the subtle body (energetic body). Creating a focused (ekagra) mind not being distracted by the outer world or the body itself. breath exercises to lengthen and control the breath. The breath connects the body with the mind, and the breath is way to control the mind. 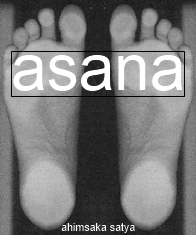 Asana works from the outer body to within, pranayama from within to the outer body. turning the senses within and start controlling the senses. 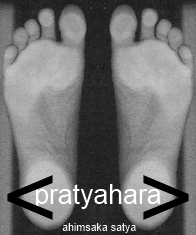 one-pointed mind (ekagra eka=one agra=foremost). when concentration is effortlessly the mind enters into the state of meditation. when meditation is effortlessly the mind and the sadhaka (practitioner) are entering samadhi, the state where the body and senses are at rest, the mind and reason alert, and transcended consciousness. The sense of “I” or “mine” are dissolved.